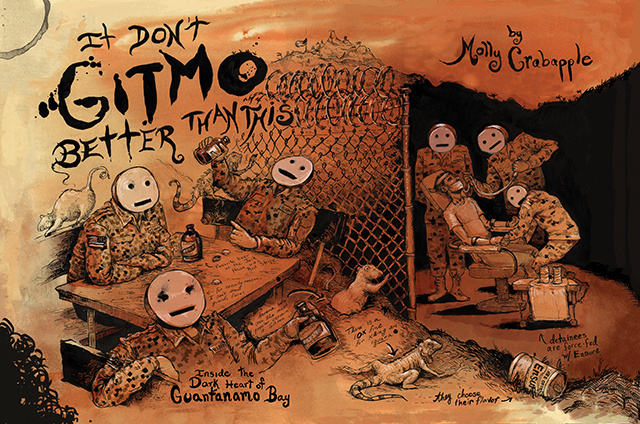 It Don’t Gitmo Better Than This: My longread for Vice magazine is now live. Camp X-Ray has been abandoned for over a decade. Birds nest on the razor wire. Vines have overtaken the cages. With the breeze and butterflies, one could think it is just a still-standing reminder of a shameful past. For the current prisoners who passed through X-Ray, it is still part of their reality. They may have left, but they are not free. 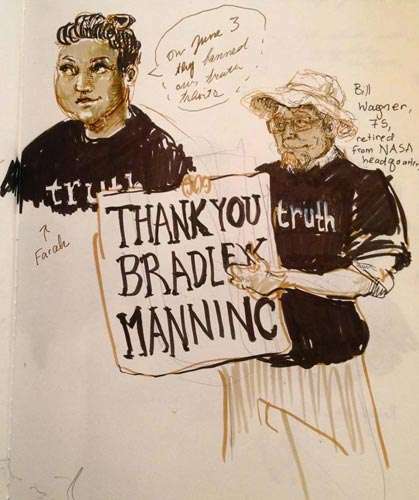 The Bradley Manning Truth Brigade: In Ft. Meade, VA, I have been sitting in the court room for Bradley Manning’s trial, drawing and writing to cover the verdict. This entry was posted in Uncategorized on August 1, 2013 by Molly. I love you more and mote, Molly Crabapple! Make a Manning tee-shirt on black for me?